45 minutes prior to cooking, mix a liberal amount of sea salt and water in a steel bowl. Brine the pork chops in this in the refridgerator. Remove pork chops from brine, pat dry with paper towels, and salt briefly. Preheat grille pan on medium heat with a splash of olive oil. Preheat oven to 350. Sear pork chops on both sides, about a minute and a half per side. 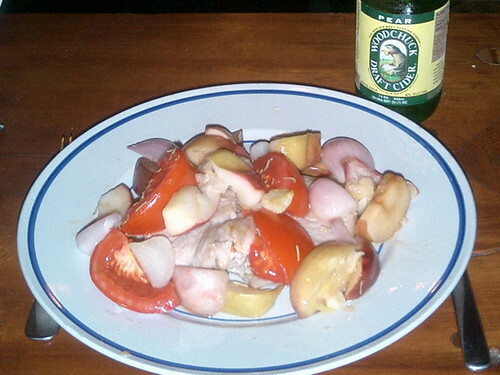 Roughly chop apples, tomato, shallots, and garlic. Add fruit / vegetables to pan, seasoning with salt, pepper, and sage. Using handy digital meat thermometer, bake in the oven until the pork reaches 155 degrees Fahrenheit, something like 20 minutes. If I hadn’t been totally out of aluminium foil (or if I owned a lid for my pan), I would have covered the food before baking to keep a bit more moisture in, although the combination of the brining and the liquid from the tomatoes did a fine job keeping the meat juicy and tender. Yakitate!! Japan is a semi-educational series following the challenges of a young boy, Azuma Kazuma, as he tries to create a national bread for Japan, “Japan” (a pun on “pan” meaning bread). With “solar hands” allowing accurate control of yeast fermentation, his baked concoctions cause over-the-top anime reactions from anyone who takes a bite. He comes from a small town to the big city to compete first for a job, and then in baking competitions. I haven’t yet figured out if this program intends to convince children to become bakers, or if it’s simply an example of the Japanese fetishization of competitions combined with their impressive love of food. There’s also an attention to accuracy admirable for an anime; they apparently employ the owner of a Kyoto bakery to concoct the show’s creations in reality. Truth checking, or brilliant marketing ploy? Either way, watching an episode kicks my pastry cravings into high gear. As far as I’ve been able to tell, the only way to watch this show is to go out and find a fan-subtitled version on one of the BitTorrent forums; maybe someday it’ll show up on a legitimate American DVD, but it’s a little too dedicated to its niche to find mainstream appeal here, and is far too manic for the Food Network to ever import it. Thankfully, the fan subtitlers tend to put in extra notes explaining the frequent puns, a subtlety I’ve never seen captured by a commercial subtitler. Boil water, cook and drain pasta. 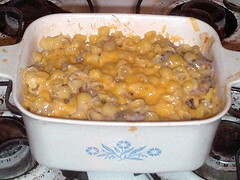 Reserve in oven-safe casserole dish. Add pepper oil to small pan at very low heat. Chop garlic and shallots, add to oil to sweat for a while. Dash with salt after about a minute. Break sausage into many small pieces. Raise heat to medium low, add sausage. Once sausage has browned through, turn off heat. Add milk into the pan and stir in prepackaged cheese powder. Add cracked black pepper to taste. Mix pasta and sauce thoroughly in casserole. Top with grated cheddar and romano cheese. Cover dish and cook in oven for 15 minutes. After a trip to the McCarren Park Green Market, I had a lot of vegetables to eat up, including fresh tomatoes and some early corn (this recipe posting was originally written up about a month ago, when corn was still early). I also had some rapidly aging food in the fridge/freezer that needed getting rid of, like red cabbage, a few-day-old onion, and a package of FreshDirect‘s chorizo. 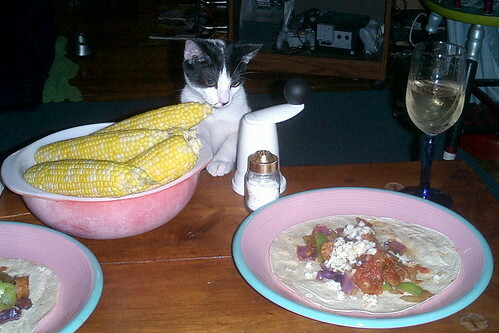 It was high time to put everything together with some spices and make some tasty fajitas! Break eggs, two at a time, and cook in butter in a small skillet. Fold cheese in before they’re done. Wash and roughly chop potato. Rinse in cold water to remove some of the excess starch. Dry, and then coat with spices. Preheat oil in a small skillet; fry the potatoes for 10 minutes or so. Reheat chili in the microwave. 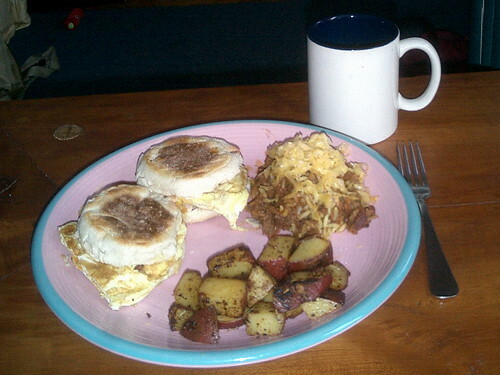 Plate as sandwiches with chili and potatoes on the side (although the chili ended up being much better when eaten as part of a sandwich).